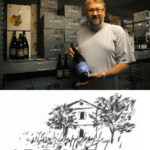 Christoph Kunzli had the opportunity to become acquainted with the “BOCA” wine production region when in 1988, together with Alexander Tolf, he met Antonio Cerri. At that time Antonio was more than eighty years old and one of the last local wine growers to produce and cellar the typical and outstanding Boca wine. Christoph was immediately fascinated by the uniqueness and the beauty of the vineyards on the hills near Boca, and by the sumptuousness of its wines as well. Antonio had been making wine for his family and his friends all his life. His vineyard was planted with Nebbiolo (called Spanna locally) and Vespolina in the early 1920’s. It was small but beautiful, facing south and sheltered from the hill on which it was planted. The Boca wine region is the most eastern and highest one (420 – 520m) in Piedmont (district of Novara), situated between Valle Sesia and Lake Orta and nestled in the foothills of the Lower Alps. To see it now one would never suspect that this tranquil corner of Piedmont, once blessed in a golden age, suffered like many appellations of Northern Italy, the repeated abandonment of the countryside…so much that the forest took back what was once hers. The wild landscape, Chestnuts, Beach trees, Cherry trees, Pines and ancient Oaks occupied this space, while farmers, who migrated towards the industrialized areas left behind the ancestral wine-making territory. By the 90’s Boca with less than 10 hectares, was almost totally abandoned. When Christoph and Alexander visited Boca, it was love at first sight. Following a tasting of Cerri’s wines Christoph and Alexander decided to purchase the vineyards, the barrels (still full) , a nice archive of library vintages, and a small broken down building right in the middle of the vineyards. Over the course of 10 years, Christoph and Alexander, convinced Antonio that they would honor his ancient way of making wine. With out heirs interested in the continuing Antonio’s tradition, Christoph and Alexander slowly acquired and cleared small plots of land and like a puzzle the property soon grew together. On the newly restored vineyards they planted Nebbiolo, Vespolina and Croatina vines so that now the “Le Piane property has 8.0 hectare of vineyards, 2 of them from old vines. On some of these vineyards Kunzli restored the Maggiorina system, where four vines evolve in the four cardinal points, form a cup of sorts. 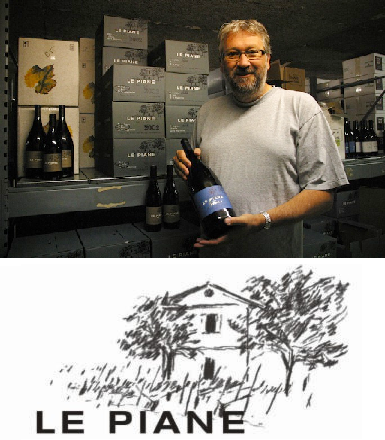 The Boca And Colline Novaresei DOCs are producing wines of strong character from this “terroir”. The combination of its soil and microclimate is a lucky chance for this region. The soil is porphyry (volcanic origin), crumbled on its surface to fine gravel. This soil is unique in Italy. The moderate climate of the Lower Alps characterized by high autumnal temperatures, together with intensive sunshine thanks to southern exposures, offers the best conditions for a perfect maturity of the grapes. The embedded vineyards between the surrounding hills are protected against the cold alpine winds. Made without the use of modern technology, these wines speak the language of time gone by.